My little Irish lass has finally made it to So September. 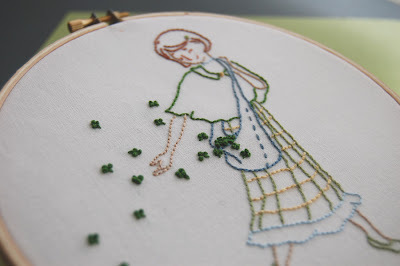 When you see those little french knot shamrocks then I'm sure you will understand why I was compelled to stitch up a sample first before I just let her loose in the world - so much fun! Now it's your turn - find the free .pdf pattern right here! I had a ball with this one, I must admit. I kept the sample pretty basic - back stitches and french knots only. But I would love to do some fill stitches here and there too- her shoes, maybe her hair and that skirt would be fun too! Even though this does have a St. Patrick's Day theme I think those shamrocks could be turned into flowers pretty easily to make it more of a Spring themed piece, don't you think? Just take out the stem, add another knot or two to them (right now they have three knots each) and stitch them up in pink or yellow and she could be sprinkling Springtime instead of luck. Oh, one other note on this pattern. In the pattern itself I drew her with freckles but I just could not for the life of me get them to look right when I stitched them. My guess is that at this size (she is in a 6 inch hoop) it is more difficult than if she was stitched slightly larger. When I did it, it was hard to differentiate her eye from the freckles but in a larger size maybe different stitches could be used to make that distinction. Or maybe I just should have used other floss colors - I'm not sure. If anyone is able to solve this dilemma please share your secret! Thanks everyone - happy stitching! Oh, she's so pretty! Thanks so much, I can't wait to stitch her up! I think I'll leave the clovers as clovers - I'm Irish (and Scottish) so clovers have a place all year long! I think you're right about the freckles. I think on such a small space they would be overwhelming, but would definitely work in a bigger version. sooo beautiful!! and you are so generous! thanks for sharing it!! this is so cute and beautiful! thanks so much for sharing! This is such a lovely pattern. Thanks so much for sharing - I want to put her on a tea towel! You're a very talented illustrator. Thanks for sharing your work. Oh she is so charming! Absolutely adorable and I can't wait to stitch her up, too! Thank you sew very much, Corinne!! Lovely! I can't wait to stitch this up! Thank you! So pretty, and I know someone who would love this as a gift! I very rarely stitch other people's patterns--prefer to draw my own--but this one is going on my to-stitch list. Thanks for sharing it! This is so charming! I'm going to make this a fun project just for me! Thank you! Thank you for sharing!! I'm tempted to just take a fine point pen and dot in some freckles. I think they are so cute, but I can see how it would be tricky with thread. Wonderful Illustration! Thank you so much! I know an someone who will adore a pillowcase featuring this lovely Irish lass. Can't wait to get stitching! I love this!!! I gave you a shout out on my blog!!!! Aye, so! I think my daughter "Clover" may need this on something. Love the French not clovers! Thank you for sharing! She's beautiful! 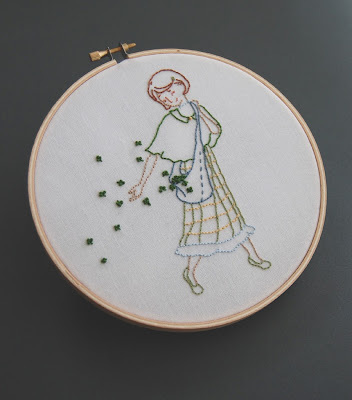 I'm going to have to practice my french knots some more! THANK YOU FOR SHARING THIS BEAUTIFUL PATTERN. I AM GOING TO PUT A LINK ON MY BLOG TO COME TO YOUR BLOG FOR THIS BEAUTIFUL PATTERN. Thanks everyone for so many lovely words about this pattern. I hope anyone who stitches this up will consider sharing a photo or two of their creation - I would love to see them! Thank you! She is simply beautiful - so full of life and whimsy! Love the wink! Oh she is absolutely darling! Thank you so much for sharing this pattern! I have been looking for some fresh inspiration. I think it'd adapt quite well to a sweet gift for a flower girl. Hey, Corinne--I can't find your email. Will you email me? I have a question for you, my dear! OMG she is soooo cute! Thanks for sharing her! I want ot go stitch her up right now! found this link via Pop Culture Junkie. this is so cute! I'm totally following you from now on ;) i love anything craftsy. I love this, it's so sweet and happy! Oh, she is so cute! I can't wait to begin stitching her. Thank you for the wonderful pattern! its soo cute! if u didnt want clovers, u could use several shades of pink so they would look like flower blossoms. Just found her and can wait to make her. Thank you! 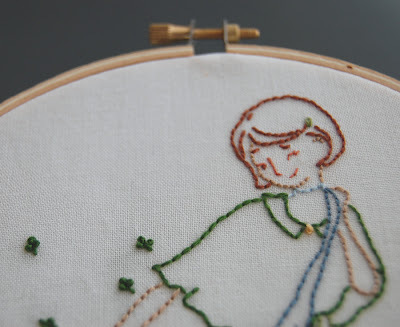 I have been scouring the internet for embroidery patterns with kind of a vintage feel and I'm so excited I found your blog. Thank you so much for making this pattern, how in the world do you create these amazing patterns? lol thank you thank you. I just found this -- it could also be done with hearts for valentine's day, little yellow and orange leaves for fall, and on dark fabric with white for winter, or stars for night time... it's just perfect for so many things! Thanks for this lovely embroidery pattern, I've just used it for a little bag (you can see it on my blog) and I'm so happy with it!